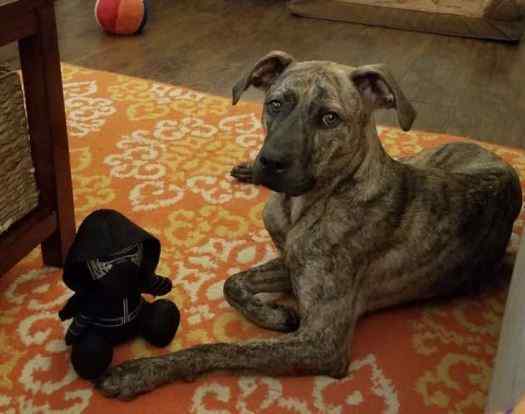 Olaf the Plott Hound mix is a very special dog looking for a loving new home. He lives with his owners in Central, SC, but can be adopted by dog lovers anywhere within a reasonable distance of Central, SC. Just 18 months old and a nice, medium size dog at 45 pounds, Olaf is Neutered, Microchipped, Fully vaccinated, Crate Trained, House Broken, Leash Trained and Obedience Trained. He is very handsome, and has a gorgeous brindle coat that is very easy to care for. He is great with children and a well behaved cuddle bunny who loves to play with sticks. Olaf is ready-to-love, and needs a home where he can be the only dog. Adopt this very special young dog today. Questions about Olaf? Contact our SC Dog rehoming team today. Text “Olaf” to (888) 833-2128 or email Olaf@Dog-lover.us. We look forward to hearing from you. Olaf is very sweet and loves people. He is calm in the home and loves to snuggle. His favorite thing to play with is sticks in the yard. He is very attached to people but is not a dog for those with other dogs. He is trained, house broken, and up to date on flea and tick medication and vaccines. Why is Olaf Being Rehomed? We feel he would do best in a one dog home. He is very sweet, great with people, but is very uninterested in interacting with our other dog. If you are interested in adopting this special Plott Hound Mix For Adoption in Central SC, please fill out our online meeting request below. Once received and reviewed, our staff will ask the pets owner to reach out to you and arrange a meeting. There is a $150 adoption/rehoming fee. Some supplies and veterinary records will be included. Questions about Olaf? Contact our Plott Hound Mix Dog rehoming team today. Text “Olaf” to (888) 833-2128 or email Olaf@Dog-lover.us. We look forward to hearing from you. Adopt this Plott Hound Mix Dog in SC today.